Battleship Guilio Cesare with 120 mm/50 (4.7") OTO Model 1933. ANB Photograph. First manufactured by Ansaldo in 1926, this gun was continually modified throughout the 1930s by both Ansaldo and Odero-Terni-Orlando (OTO). 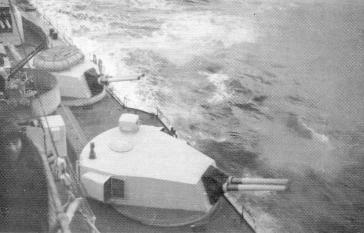 Fired separate ammunition and used horizontal sliding breech-blocks. These guns in the twin mountings suffered from excessive dispersion which seems to have been the result of mounting the barrels too closely together. 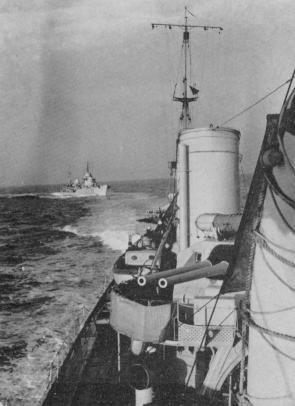 On later destroyers, a single 120 mm/50 (4.7") mounting was used to replace obsolete 120 mm/15 (4.7") star-shell howitzers and thus improved the ship's firepower. ^Outfit for Navigatori class was 408 AP, 672 HE, 120 incendiary and 100 star shells plus an unspecified number of ready rounds. ^Twin mountings had electric power for training and elevation. 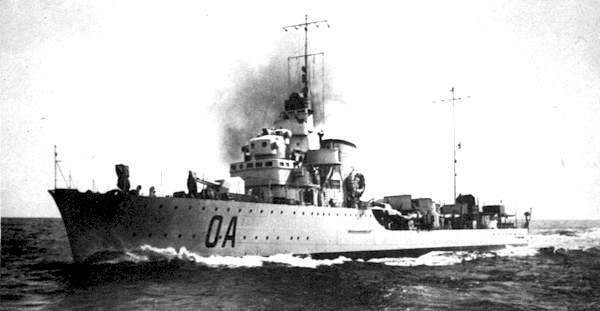 ^The OTO 1933 mountings used on the Conte Di Cavour class were different from the concurrent ones used on destroyers in that they were equipped with mechanical rammers, better shell and propellant hoists and had a much thicker shield. Destroyer Navigatori. Amidships 120 mm/50 (4.7") Ansaldo Model 1926. Destroyer Alfredo Oriani with 120 mm/50 (4.7") Model 1936. This destroyer was later ceded to France and renamed D'Estaing. Marina Militare Photograph. Destroyer Bombardiere. Fore and aft mounts are 120 mm/50 (4.7") Ansaldo Model 1937. Amidships mount is Ansaldo Model 1940.